NY Assemblyman Wants to Ban the use of WHAT? Salt. Yes, you read that right. Salt. We don’t need lawmakers telling us what we should and should not eat. Most of us are perfectly reasonable, fairly intelligent, and fully capable of making our own decisions when it comes to what we put into our mouths. I am tired of politicians trying to legislate common sense. 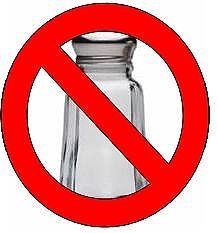 First the trans-fat ban, then mandating calorie count listings on food menus, then taxing soda and sugary drinks, and now salt. Where does it end? Banning sugar? Excise tax on chocolate? Prohibiting FOOD? Leave me alone, please. If I want to eat potato chips, I’m going to eat potato chips, and assume all risk for doing so. I know what’s in them, I know how many calories and the amount of salt they contain, and I know they will make me gain a pound. But, this America, and I am free to pursue happiness. Potato chips make me happy. Eating potato chips is MY CHOICE. If you want to educate people about proper nutrition, that’s fine. More than fine, in fact. More people should know how to feed their bodies in a healthy way. But, there’s no need to create laws that ban entire food categories. NECESSARY food categories, I might add. Without sodium, you WILL DIE. So, basically, this guy’s father didn’t know when to put down the salt shaker, so New Yorkers should suffer the consequences of his poor decisions? I don’t think so. I understand that the likelihood of this legislation going anywhere is practically zero (I hope), but it galls me that this type of lunatic law gets proposed at a time when our state is going through one of the worst fiscal (and ethical) crises that it’s ever seen. How DARE he waste the taxpayer’s time, and insult our collective intelligence, by proposing something so ill-conceived, poorly researched (read: no research at all) and idiotic? New York State has become a joke, both inside our state borders, and throughout the nation. I am embarrassed to live here.